A blueberry bagel with cream cheese on a plate. A blueberry bagel with cream cheese imparts a fruity, creamy taste. The blueberries in the bagel do contribute a few more calories to this meal, but it also helps you incorporate fruit into your diet. One 4.3-oz. blueberry bagel with 1 tbsp. of cream cheese contains 365 to 374 calories. Go Ask Alice! -- Columbia University's Health Q&A Service -- recommends starting your day with a 350 to 500 calories, which makes this a good choice for breakfast. A 4.3-oz. bagel with 1 tbsp. of cream cheese provides you with 67.3 to 73.8 g of carbohydrates, 10.8 to 12.1 g of protein and 4.6 to 5 g of fat. These macronutrients make up the calories in a bagel and give you the energy you need to make it through the day. 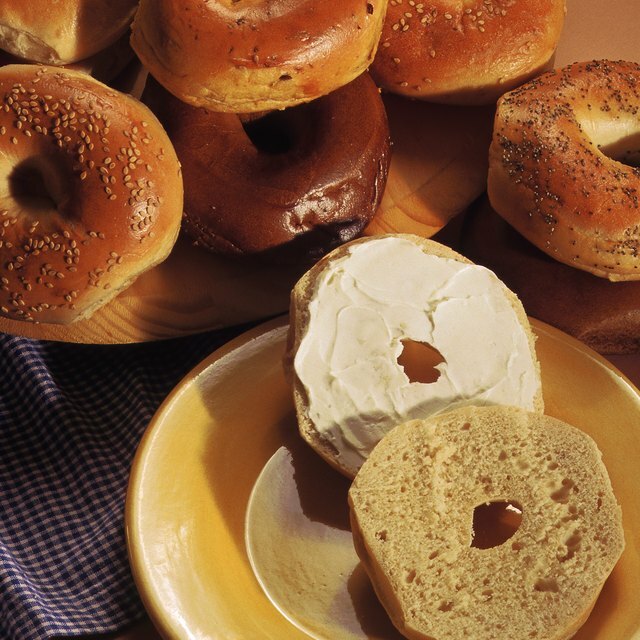 A blueberry bagel with cream cheese contains a high amount of sodium -- 520 to 572 mg. The American Heart Association recommends limiting your sodium intake to no more than 1,500 mg per day to avoid health problems such as high blood pressure.